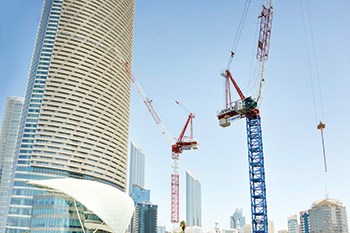 Raimondi Cranes at the Corniche Tower in Abu Dhabi. Raimondi Cranes, a leading Italian-based group, says the UAE-based Nurol Construction Company has deployed two of its luffing jib crane models on the Corniche Tower jobsite in the capital, Abu Dhabi. The Raimondi LR165, part of Nurol’s existing fleet, is accompanied by a new luffing LR213 recently purchased by Nurol. The new tower, a 35-storey mixed-use development, is located on the emirate’s sought-after waterfront. “Raimondi Middle East supported Nurol with the sale of the LR213 equipped with the deluxe R16 crane cabin. As part of the contractor’s fleet upgrade, the luffing LR213 was chosen for its maximum lifting capacity of 14 tonnes and its versatility in areas with difficult-to-obtain fly-over permissions,” remarks Wael Hasan, the commercial director for Middle East at Raimondi Cranes. The LR165, with a 55-m jib length and an height under hook (HUH) of 45 m will eventually climb to 172 m, while the LR213 55-m jib length and an HUH of 45-m will eventually climb to 187 m.
“This jobsite has multiple security restrictions together with an extremely congested set of high-rise developments, so much of our team’s support is focused on site planning ahead of the installations,” states Hasan. To best service Nurol for the jobsite, Raimondi initially provided three-day crane operator training sessions. The Corniche Tower jobsite is also subscribed to the monthly maintenance programme offered by Raimondi Middle East,” explains Hasan. “Later, we will be supporting this jobsite by dismantling the LR165 using the LR213 as a cost-saving initiative, and to adhere to our client’s needs. Raimondi dedicated a considerable amount of technical support and technical study to propose this solution for our client,” he notes. “Due to the existing developments surrounding the jobsite, we were informed that mobile cranes are not permitted in the area. We then executed a study and came up with the solution of utilising the LR213 in the dismantle process,” he adds.